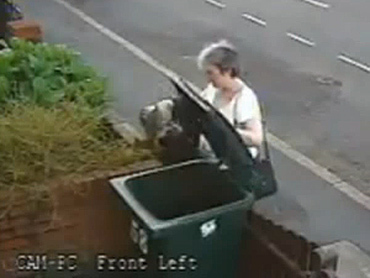 A British woman caught on tape stroking a cat, picking it up by the scruff of its neck and casually throwing it into its owners' trash bin pleaded guilty to a single charge of animal cruelty Tuesday. Footage of Mary Bale's bizarre attack on 4-year-old Lola outraged animal lovers across the world when it was posted online this summer. (See video below). The video, shot by a security camera installed by Lola's owners following a spate of thefts in their area, has been seen more than 1.2 million times on YouTube. Even though Lola was eventually recovered unharmed after its owners heard its muffled cries from inside the bin, angry Internet users pledged retribution and police had to post guards outside Bale's home. Bale, a 45-year-old bank worker, has described the incident as a "split second of misjudgment that has got completely out of control" but offered no explanation for why she did it. She pleaded guilty to one count of causing unnecessary suffering to an animal at Coventry Magistrates' Court, in central England. The court fined her £250 (just over $395) and ordered her to pay more than £1,100 ($1,800) in costs. District judge Caroline Goulborn told Bale that she was taking into account the media interest surrounding the case, which "has resulted in you being vilified in some quarters" as well as the condition of Bale's elderly father, who was gravely ill at the time. "I accept that you were in a stressful situation at the time, but that's no excuse for what you did," Goulborn said. Bale, who appeared close to tears during the hearing, was also banned from keeping or owning animals for the next five years. To watch reports on the original surveillance tape and the outrage it sparked online, click on the videos below.